I have family right outside Newport, so when ABF & I were visiting the area, we made plans for dinner with my aunt and one of my cousins. 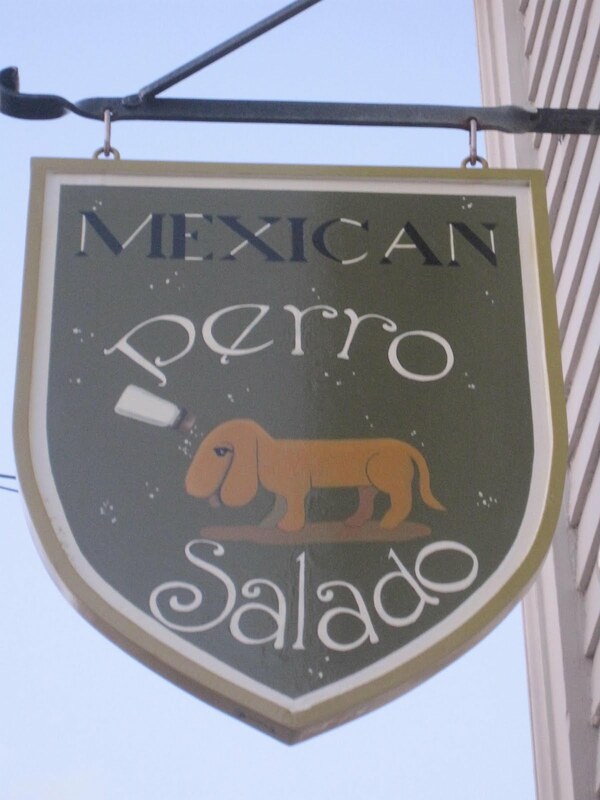 They spoke very highly of Perro Salado (the salty dog, apropos for Newport! ), which had Mexican food and killer margaritas. I'm in! 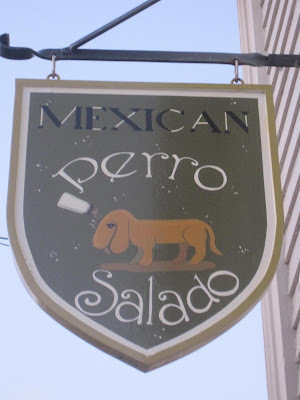 True, in the back of my mind I was a little skeptical about how good Mexican could be in New England, but my experience at Martha's Vineyard's (now-closed) Zapotec was enough to have me keep an open mind. Plus--margaritas! The restaurant is in a lovely colonial house which still has the individual rooms and doorways intact. What a fun, funky setting! We started with a round of drinks--their margaritas were impressive. My aunt ordered the house, my cousin ordered the spicy cucumber, and I opted for the cilantro-jalapeno. Woot! I was warned to expect spicy, as the jalapenos are muddled into the drink, and I said BRING IT! ABF took a sip and said "That will melt your FACE off!" I didn't think it was quite that bad, but it was deliciously spicy, which helped me pace myself instead of drinking the tangy-salty-sour-sweet drink too fast. ABF wanted a Dos Equis on draft, but they were out, so the server recommended Sol, another Mexican beer. He seemed to like this and said it was pretty similar to Dos Equis. We ordered a round of guac and chips for the table. I have never seen so much guacamole, with basic chips but a nice sprinkling of pumpkin seeds on the guacamole, too. We laid into it, and yet with four hungry people, we still couldn't finish it. Very generous serving! ABF ordered the fish tacos--fried mahi-mahi (I think?) on tortillas. He said the fish was good, but the tortillas got wet and fell apart, so he had to eat it with a fork and not in its original taco formation--no big whoop, just a little less hands-on than he expected. I tried a bite of the fish and it was perfectly fried--yum. I ordered the ropa vieja (beef) enchiladas. The meat was tender, spicy (though not as spicy as the pork, which my cousin K ordered), and delectable. I put a damn decent dent in this dish, and of course I shared some with ABF. Really, really good. Like "I can't believe I'm east of Texas" good. It had a tangy ranchera sauce cooled off by lots of melty, cheesy goodness. THIS was comfort food, Tex-Mex style. I also had one more rita before we left--this time ordering the highly-praised blood orange version. This was good! Not as sweet as I worried it might be, with a delightful citrus tang to it. I think I still prefer the jalapeno version but if you're not into spicy, try this one. Or like me, try both! The lighting is very low (hence my use of the dreaded flash), it's a bit noisy inside, and there's not a ton of room, but you'll be so busy eating you will probably not even care. I would go back here in a heartbeat--thanks, Auntie C, for suggesting such a delicious destination for our dinner!